Christians are responding to a terrorist attack that has killed 15 and injured more than 70 innocents, but this is only the latest in an ongoing series of attacks against the Christian community that has left hundreds dead since the past few years. Churches have been bombed. Homes have been burned. Innocent people have been burned alive. Years have passed and Christians have seen no justice from the state. Christians are not the only community under threat in Pakistan. Shia, too, continue to be killed by the hundreds. The main response from the state to protect these citizens so far has been to arm Shia seminaries, mosques and imambargahs to defend themselves. 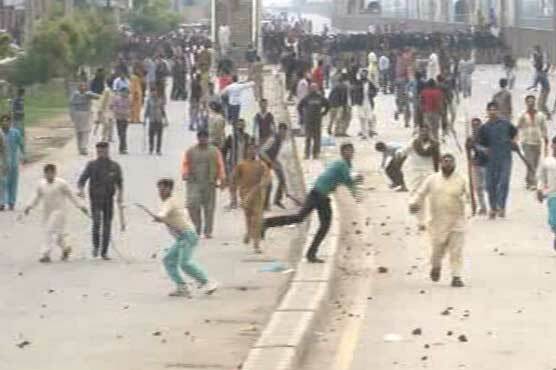 However, the killing of two suspected terrorists by Christian protestors in Lahore has resulted in an outpouring of concern about the legal rights of the suspects, which brings the question whether the same concern for legal rights of anti-Shia terrorists would be raised if these weapons were actually used to defend against a terrorist attack? The bigger concern, though, is that after decades of abuse and neglect at the hands of extremist militants and the state, the damn is beginning to crack and the outrage of Pakistan’s besieged minorities will be unable to be contained much longer. This doomsday scenario is now being warned even by experts who have previously downplayed concerns about Pakistan fracturing from internal cracks. Ominously, this reaction could mark the start of a dangerous yet sadly logical new phase in Pakistan’s sectarian conflict — one that deepens the fault lines of an already fractured country, and that could one day, bring it to the cusp of all-out civil war. Despite being ravaged by radicalisation, Pakistani society’s capacity to do great things remains unlimited; many outside observers, including myself, have long admired it for this very reason. And yet, thanks to an absentee state and a militant juggernaut, it could soon find itself being torn asunder. We understand the plight of Palestinian Muslims who, under the heavy yoke of Israeli oppression, have risen up to demand their rights as human beings. An oppressed people can only bear pain and humiliation for so long before they begin to fight back. Now the same scenario is playing out on our own streets. Will we be able to recognise it before it is too late? This entry was posted in Blogs and tagged Christians, extremists, lahore church bombing, minorities, sectarianism, Shia by Omar Derawal. Bookmark the permalink.